The internet is a beautiful thing. Back when I postedthe recipe for no-knead artisan bread, I made a new friend on facebook. Her name is Hendrika, and she is from the Netherlands. Hendrika (also a baker) recommended making a whole grain version. She said to replace 25% of the flour with whole grain flour, and increase it up to 50% for a heartier bread. Then roll the dough in old fashioned oats before the second rise. And it worked beautifully! I even added a little honey for a hint of sweetness. What’s great about this recipe, is that it’s made in the exact same fashion as the original no-knead bread (who doesn’t love baking in a dutch oven?!) The only difference is the ingredients. I went with a smaller amount of whole wheat flour as I prefer a lighter, less dense bread. However, I’ve made it using a 50/50 ratio and it was just as good- it’s simply a matter of personal taste. I also added a touch more salt to enhance the flavor. The result was a nutty, golden bread bread with a soft and chewy interior. The crust was perfectly crisp. And that is the beauty of the internet. It brings together like minded people. As for us, we’ve been enjoying the fruits of my labor in sandwiches, french toast and dunking in soup. The kids go crazy for this bread. Any leftovers are blitzed into breadcrumbs and stashed away in the freezer. As I’ve mentioned before, there’s nothing like making your own bread and once you get started the possibilities are endless. Thanks Hendrika, for the fabulous idea! For a step-by-step tutorial on making no-knead artisan bread, click here! *It’s interesting to note that this dough is not as wet as the original version. Whole wheat flour absorbs more water resulting in a drier dough. Keep in mind that you might need to add additional water to bring the dough together. Do this 1 tablespoon at a time until you reach your desired consistency. * I used King Arthur bread & whole wheat flour and SAF instant yeast. * You can use any 6 quart dutch oven, cast iron, enamel, Pyrex or ceramic bakeware (with lid) that can heat up to 500 degrees F.
Make the dough: In a large bowl whisk the bread flour, whole wheat flour, yeast and salt. In a separate bowl, combine the honey and water. Add the water mixture to the dry ingredients, and stir until combined; dough will be wet and sticky. I If your dough seems very dry, add more water (do this 1 tablespoon at a time) until desired consistency is achieved. Transfer dough to a lightly oiled container and cover with plastic wrap. Let the dough rise for 14 hours- overnight, at room temperature (about 70 degrees). Your dough is ready when it has puffed up in volume, about 1½ -2x its original size. *See note below. Shape the dough: Lightly flour a sheet of parchment paper and place the dough on top. Fold the dough in half and then fold it in half again. Add more flour to the parchment paper and sprinkle the oats on top. Shape the dough into a ball by tucking the sides underneath itself, and then roll it around in the oats to coat. Place the dough onto the paper seam side down. Cover and rest again until puffy in shape. This will take 30 minutes- 2 hours depending on how warm your kitchen is. Preheat your oven to 400 F. Put a (6 quart) dutch oven pot inside for 20 minutes. When the dough is ready, remove pot from the oven. Place your hand underneath the parchment paper and invert the dough into the pot. The seam will be facing up. Cover the pot with the lid. Bake the dough: Place your bread into the oven, and immediately reduce the temperature from 400 to 375 F. Bake for 30 minutes, covered. If you find that your bread is browning too quickly, reduce the temperature to 350 F. Remove the lid and bake for an additional 20 to 25 minutes, until golden brown. To make sure that the bread is completely cooked through, take its temperature. Carefully tip the bread onto its side and insert a thermometer into the bottom. It should read 200-205 F. If not, place it back into the oven until it it's cooked through. If you’re worried about the top getting too brown, loosely tent the pot with foil. When finished, transfer the bread to a wire rack. It should feel light and make a hollow sound when you give it a knock underneath. Let it cool for at least 1 hour. Cutting it too soon might ruin the texture resulting in a gummy crumb! * If your dough isn’t puffed and bubbly after the initial rise, place it in the microwave with the light on (keeping the door ajar). The warmth from the light will give the yeast a boost. My friend Celia gave me this tip and it works like a charm, especially in chilly kitchens! This is a beautiful loaf of bread and I imagine your kitchen smelled heavenly while it baked! No knead bread was designed with me in mind…assuming I can make peace with yeast. :) I’ll be giving this a try soon! Was there a typo? Only 1/4 teaspoon of yeast? Surely there is more yeast than that; I’ve been baking bread for some time now and never seen a recipe with so little yeast. He uses a small amount of yeast to achieve a ‘slow rise.’ Using a larger quantity would speed up the fermentation process, thus making the rise time considerably shorter (which is probably what you’re used to). This shorter rise time would yield different results than his original recipe. if not all purpose flour then what kind is it ? I always use it for everything. some people say cake flour too but i use only the all purpose? what kind do u call cake or bread flour? brand name if you will please? Hi there! I use bread flour (it’s listed under ‘ingredients’ in the recipe above). The brand that I use varies; King Arthur or Gold Medal. I found your bread recipe this evening and decided to make it. The trouble is I don’t have a Dutch Oven so will use a 10″ cast iron skillet and a baking dish full of water. I think I’ll start at 500 for 10 minutes then 375 for 40 minutes. Rather than the microwave, I use my oven instead with the light. Works the same, I use the oven all the time when I make bread really speeds the rising when you use yeast. I put together a healthy soda bread that I cook in a 8″ cast iron skillet. It takes 20 minutes to prepare and 50 minutes in the oven. Done. I am sending you the recipe if you would like to try it. I’ll let you know how the bread turns out. 1. Turn oven to 375 degrees. 2. Mix all dry ingredients in medium bowl. 3. Mix all wet ingredients in small bowl. of bowl and no dry indredients. Kneed 3 or 4 times in bowl to combine. 5. Put mix in a 8″ cast irion skillet. 6. Bake in oven for 45-50 min. 7. Cool on wire rack for 30 min. THIS IS AMAZING!! I have been experimenting with no knead cast iron bread for a few weeks. This recipe is the best, by far, of any I have made. Thank you!! Love your website! Hi! I’ve been making Jim Lahey’s bread for awhile now. 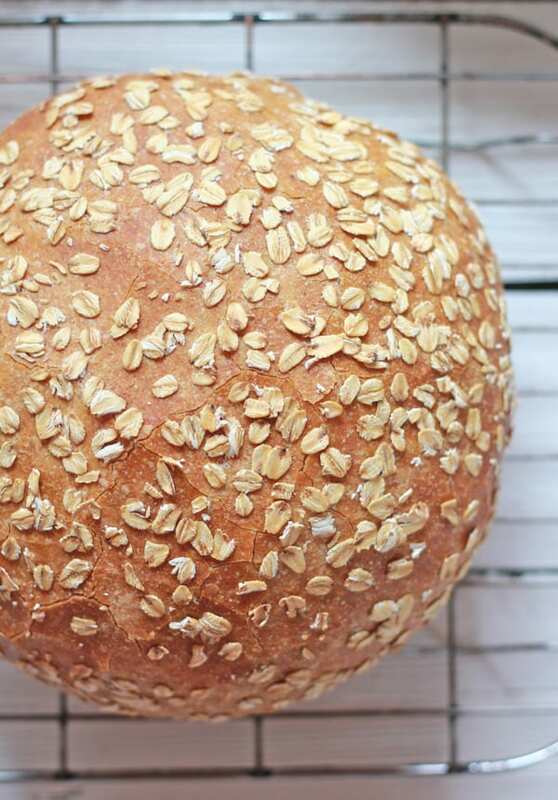 I am eager to try this variation with whole wheat and honey. I’m curious why this loaf is baked at a lower temperature. Is it because the addition of honey would make it brown more easily at the higher temp? You know, I’ve never tried this with 100% whole wheat flour. I do know from baking in general, that you will most likely have to add additional water to the recipe. Whole grain flours absorb more than regular flour. But I do not have an exact measurement for you as I’ve not done this myself. Do you have experience with bread? Perhaps you’ll be able to tell by feel? The dough should be pretty sticky. Also, when using 100% whole wheat, the loaf will be more dense. If you experiment, I’d love to hear back. Happy baking & good luck! Like everyone else, I love this recipe :) I make it weekly now. I’m new to bread and have ZERO dough-sense, so a recipe like this where you handle it as little as possible is perfect for me. I have one quick question, though. Your recipe calls for 1/4 tsp yeast, but I have packets from my grocery that I believe are typically for a bread machine. I was like “Eh, whatever!” and threw the whole packet in. I’ve made it that way three times, and it has turned out wonderful. This last time I made the bread, however, I ran out of the packets so I bought a container of yeast and actually followed the recipe. It was a MUCH smaller amount of yeast, and you could see it in the bread. I looked at an old packet and noticed it said 1/4 oz on it. Are you sure you meant 1/4 tsp and not 1/4 oz? Long story for a short question :X Thanks again for the great recipe! Great question! Although it sounds odd, 1/4 tsp. is indeed the correct amount. When coupled with a wet dough and a long rise, you only need a small amount. Yeast is not the only factor that determines rise; one must have a sufficient (long) bulk ferment, handle the dough properly (do not over shape), use a covered pot for baking with the correct oven temperature. When all the these factors work together you will have bread with an excellent rise. However, if you preferred the results with an increased amount of yeast, by all means, go for it! I wanted you to know that since I found your recipe, I never buy bread. I make this at least once a week (or when my DH begs me to make it). This bread is by far, my favorite bread of all time. Thank you from the bottom of my heart. I have a fresh loaf sitting on my counter, cooling. Wait…. What’s that I hear?!? I do believe that loaf of bread is calling my name! Thanks again for this wonderful recipe. Wow. Marianne, it is so sweet of you to take the time to comment. I really appreciate the feedback! I have a huge smile on my face :) Enjoy that warm loaf of yours!! Hi, I tried making this bread and I found that the dough rose nicely after 14 hours but as soon as I pour it onto the parchment paper, the dough turned out to be too wet, almost like a thick pancake batter consistency. I tried to revive it by putting a lot of flour but it was too sticky that I couldn’t even shape it. I will just try to bake it and hopefully at least it will taste good. It’s wonderful to hear that your dough rose nicely, but what a bummer about the consistency! I have a feeling not enough flour was added to the dough during the initial mixing. This is not your fault; sometimes a bread dough will need extra flour on certain days hence the reason why you added some after is rose. Perhaps a little more in the beginning next time will help. Also, instead of doing your second rise free-form on the parchment paper, try doing it in a cloth-lined bowl (kitchen towel will do). The bowl will contain the spreading. 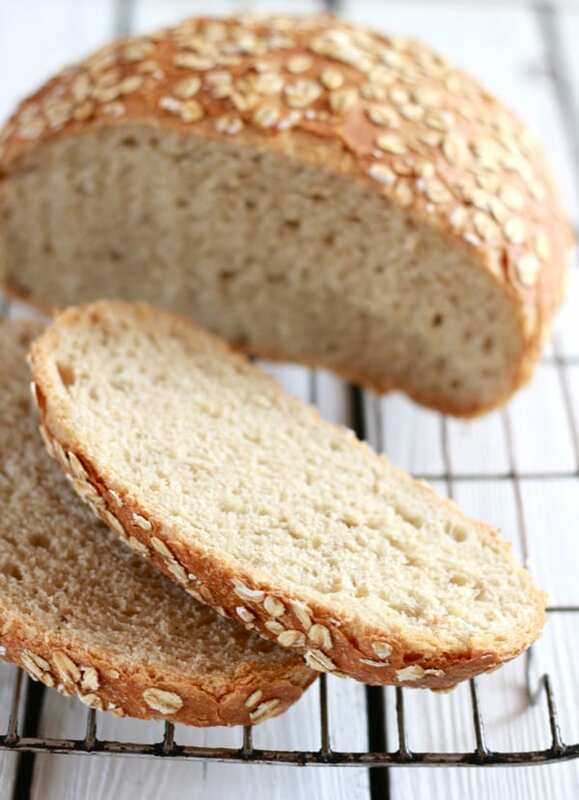 Thanks for the response, I will definitely try to make this recipe again as my husband really love whole wheat bread. The bread turned out a little bit flatter than I like (I like the round/boule shape like the one in your pictures) but my husband actually likes the taste and density of the bread. Thanks for the recipe! In order to increase the volume of your bread, you might want to shorten your second rise. This is usually the #1 cause of bread that turns out a little flat. Of course, there are other factors involved (oven temperature, length of bulk fermentation) but I have a feeling if you followed the directions correctly you can rule those 2 factors out. 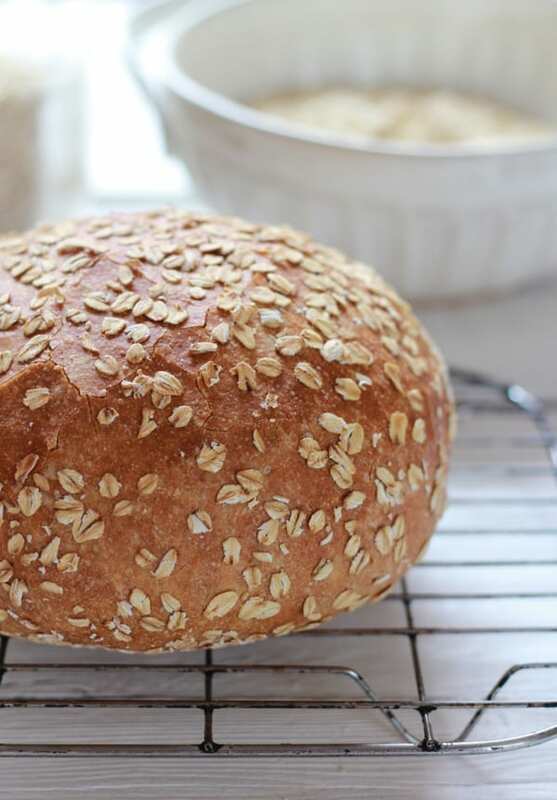 Also, whole grain bread never rises as high as bread made with bread flour. I came across this recipe last week and decided to try it camping in our dutch oven over charcoal. It was the hit of the weekend! I can’t tell you how many people I had to share the recipe with. We will be making it every chance we get, it is a wonderful addition to our evening meal. I am going to try a few variations using garlic and cheddar and maybe a cinnamon raisin. Just FYI, if for some strange reason the loaf doesn’t get eaten fast enough you can slice it up and let it finish going stale for beautiful french toast, breakfast bake, bread pudding, or cube it for wonderful croûtons for salads or stuffing. I have a 6 quart cuisinart cast iron porcelain Dutch oven, however the instructions say lid is good for 375 degrees. Would this work with the high temperatures? I would would stick to what the instructions say, just to be safe. I wouldn’t use it with the high temperatures. I made this last weekend and it was AMAZING! BUT … my bread stuck to my dutch oven and we lost all the bottom crust (it still tasted great and we ate that too!). I want to make it again though without that happening, so what did I d wrong? Should I lightly oil the dutch oven or flour it? Thanks! Thank you so much for your recipes! I’m new to bread baking and really love your beginner’s sourdough. Hence my question: could I add a bit of starter to this recipe to amp up the flavour? I can figure out the proportions I think to adjust flour and water from reading about that but I have no idea what the extra activity would do to the dough. Would it proof too fast? You are quite welcome! You could absolutely add some starter to this recipe. The extra activity will depend on several factors, including the amount of starter you add, paired with how it will react with the yeast, honey, and ww flour. I know from experience, whole grain sourdoughs ferment quickly, depending on temperature and if there’s honey in the dough. So yes, it might proof faster than usual. You’ll have to experiment and see what works best for your personal environment. And one other question – I went ahead and followed your directions to letter (as far as I can tell) but my dough seems to have overproofed in about 4 hrs. I’m using quick rise instant yeast. Maybe the ‘quick rise’ part is giving me grief? I discarded the first batch and made a second with the same results after 4 hrs – a very thin dough that doesn’t hold its shape. I’m going to bake it up this time and see what happens but I’m not hopeful. Did you add any sourdough starter this time around? I wasn’t sure based on your previous comment. Thanks! I did not add starter either of the 2 times as I’m trying to get your basic recipe down first. The one other difference tho was that I used AP flour not bread flour. Also, in case it makes any difference, the whole wheat flour I used is a red fife. There’s a big difference between AP flour and bread flour when used to make bread. Bread flour has a higher gluten content which gives your loaves more structure and a higher rise. That’s why you were having difficulty with the dough not holding its shape. Use bread flour next time for best results! Red fife is very high in minerals and enzymes, which can speed up the rise too. And that’s most likely why the dough was so quickly paired with the quick rise yeast. This recipe looks amazing. I am new to making bread and I have tried a complete 100% whole wheat one and I didn’t like the way it turned out. So I want to try this one I am just curious if I could add some sunflower seeds and flax seeds or if it would ruin the recipe and when should I add them if I can? Also when I tried to do the other recipe it was no knead recipe but I found it too hard to mix in the bowl. Would I be able to use my kitchen aid mixer with the attachment? I, like many of you, love baking bread, and I was excited to see this recipe. My only complaint is that the recipe is given only in volume. I believe that you’ll have better success weighing your ingredients so after 3 successful Boules this is my version in weight. I preheat the oven and a 4 qt Dutch oven for 30-60 minutes at 475°. I allow the boule to rise in a banneton for 1.5 hrs with the seam side down. Turn it out using a sheet of parchment then place it in the very hot pot, trim the parchment, if you like, cover and place on center rack so bottom doesn’t burn. I cook it 30 minutes at this temperature. Then I uncover it and allow it to cook 10-15 minutes. You want the internal temperature to be around 210°. You can cover it with foil if you are concerned about it browning too much.